If you’re a musician and don’t have perfect pitch (like me, most of my friends don’t), then you might be interested in this tuner I discovered a while back. It’s from a company called Snark. Don’t ask me where that name came from! Yes, I know. There are hundreds of tuners to choose from. If you’re like me, you already own four of five of them! But it seems that there is always some sort of issue with them. Some you can’t see in the dark, like when you’re playing in a show setting with little or no stage lighting. Others are great in the dark but when you play an outdoor festival you can’t see it in the bright light. Some have little lights or arrows that can be difficult to see in some environments. To me, the Snark covers all the bases. The Snark SN-2 All Instrument Clip-On Chromatic Tuner has a lighted face that is easy to see and read in the dark. It displays the note being played and has a dial of digital lights that show if the note is flat, sharp or right on. And it uses a CR2032 button battery that is pretty common and easy to find. And the price is right! 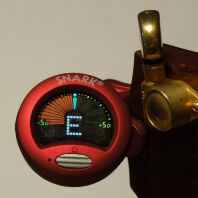 Several of my friends have the Snark Tuner and like it. I think you will be as happy with it as we are.